On Wednesday, at 19:45 GMT, a mouth-watering fixture will take place at the Vitality Stadium, as A.F.C Bournemouth will host Chelsea F.C. Both of these sides are enjoying success in the current Premier League campaign. As of now, the Blues stand in 4th place while the Cherries are placed in 12th, with a 17-point difference between the two top-flight sides. In the previous fixture between these two sides, Eden Hazard was the only man on the scoresheet as Chelsea won 1-0 in the quarter-finals of of the Carabao Cup this term. The same fixture also occurred in matchday 4, as Chelsea beat Bournemouth 2-0 at the Bridge. 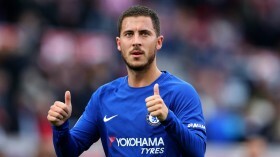 Both teams will be eager to gain points as Chelsea will aimd to narrow the gap between them and Tottenham, while Bournemouth will seek to climb up the rankings of the Premier League. Chelsea will go into the clash with back-to-back wins against Tottenham and Sheffield Wednesday. Chelsea vitally need to get back to their winning ways, as their last league game ended as a 2-0 defeat to Arsenal. Gonzalo Higuain will likely make his Premier League debut. With both Arsenal and Manchester United three points away from them, a win for Arsenal and a Chelsea loss might see the Blues stand 5th, out of a Champions League spot. Bournemouth are level with 11th-placed Everton on points and are eager to rise above them with a win over Chelsea. The Cherries are trying to get back to playing in Europe by clinching a 7th place spot, which they are 3 points away from, with 15 Premier League games to go. A 2-0 win against West Ham will give the Cherries a boost in confidence as they look to overcome another world-class team, though they will be without Simon Francis and Dominic Solanke due to injuries.